Since its foundation in 1975 the Moyzes Quartet has been one of the most notable chamber ensembles in Slovakia. 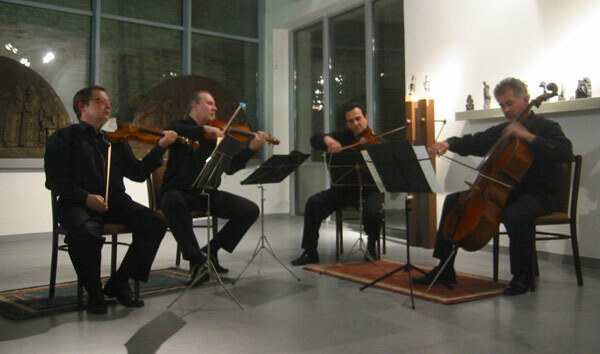 The members of the Quartet – violinists – Jozef Horváth and František Török, violist Alexander Lakatoš, and cellist Ján Slávik – graduated from the Bratislava Academy of Music and Performing Arts. The Quartet has successfully represented Slovak musical culture almost in all European countries as well as in Japan, India, Morocco, the USA, Canada, Korea and Cuba. Its repertoire encompasses all styles including works of contemporary Slovak composers, some of whom directly dedicated their pieces to the Quartet. To date they have recorded more then 30 CDs, including music by A. Albrecht, J.L. Bella, Dvořak, Mozart, A. Moyzes, Ravel, Smetana, Shostakovich, and Hummel. They have frequently recorded for Slovak radio and foreign broadcasting companies. We welcome the quartet to their first appearance at the Indian Summer in Levoča festival.